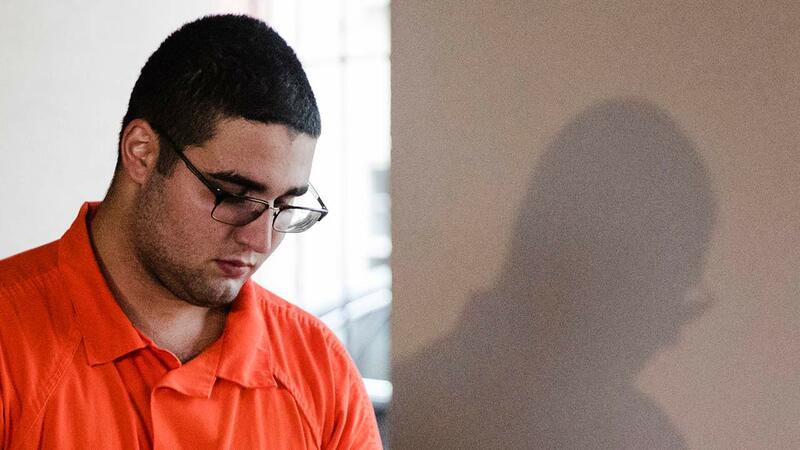 SOLEBURY TWP., Pa. (WPVI) -- Cosmo DiNardo, the 20-year-old man who confessed to "participating in or committing" the murders of four missing men in Bucks County, has been known to police since he was 14 years old, according to authorities. Prior to the events of this week, the most significant offense on the arrest record for DiNardo was a gun charge in February 2017, which was later dismissed and re-filed, court documents show. While none of the crimes detailed in the arrest record were violent, the report does makes a reference to DiNardo suffering from a mental illness. DiNardo was arrested twice this week, once on Monday on the February charge of illegally possessing a shotgun and ammunition and again on Wednesday on charges of stealing the car that belonged to one of the victims, 21-year-old Tom Meo. He was released Tuesday on $1 million bail, 10 percent of which was paid in cash. A $5 million bail was set Wednesday after DiNardo was taken into custody for a second time. Since 2011, DiNardo has had contact with police more than 30 times, although most of those cases have not resulted in arrests, a law enforcement source told ABC News. It is unclear what transpired from DiNardo's numerous interactions with police. A request has been placed by ABC News with police for all calls and service to the DiNardo family home in Bensalem Township. Aside from his arrests this week, DiNardo's most recent interaction with police involved a citation for not having proper boater's education paperwork and other equipment in May 2017. Residents from Bensalem Township told ABC News there was something "off" with DiNardo and that he changed after he was injured in an ATV accident about seven months ago. DiNardo is an avid hunter and would show off what he killed, residents said. VIDEO: Cosmo DiNardo arrives at Bucks County prison. See raw video from Chopper 6 on July 12, 2017. Remains of Dean Finocchiaro, 19, of Middletown, was found in a grave 12-feet deep after the search of the vast property owned by DiNardo's family intensified, Bucks County District Attorney Matthew Weintraub said at a press conference early Thursday. He had been missing since Friday. Finnochiaro was last seen at his Middletown Township home on Friday and was reported missing on Saturday, police said. Two of the missing men -- Tom Meo, 21, of Plumstead, and Mark Sturgis, 22, were close friends, Sturgis' father told police. Both men were last seen July 7 and failed to show up to work the next day, according to a criminal complaint. Sturgis' father told police that his son was going to meet up with Meo before he went missing. The relationships among DiNardo and the remaining victims, Finocchiaro and Jimi Tar Patrick, 19, of Newtown Township, who was last seen on July 5, are unclear. Investigators continue to ask the public for tips. Anyone with information is asked to contact FBI investigators at 1-800-CALL-FBI, or go to tips.fbi.gov. TIMELINE: Murder of 4 men in Bucks County, Pa.